Add Music To Your Jukebox! Existing customers please complete the form below to request new music for your jukebox. Big and bold, the new Ovation wall-mounted digital jukebox makes its presence felt by any location. Featuring a 19-inch LCD touch-screen monitor — the largest in the industry — the Ovation commands attention with a viewable area 60 percent larget than the typical screen display. These aren't just jukeboxes, they're an awesome, all-in-one sound system! With the help of Bose®, we've made sure the TouchTunes Digital Jukebox will blow you away. Powerful amps, speakers and sub-woofers deliver music like you've never heard from a traditional jukebox. No sheets to type up... no headaches! Each TouchTunes Digital Jukebox features a playlist of up to 2,000 songs. Songs are stored in digital format, enabling you to completely customize the playlist from our library of over 135,000 titles. Features: 100 top cd titles and over 2700 song selection. Powerful amplifier and the ability to set up a great external sound system. 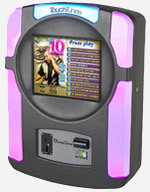 This jukebox comes with a remote volume control to easily control the volume in different parts of your business.